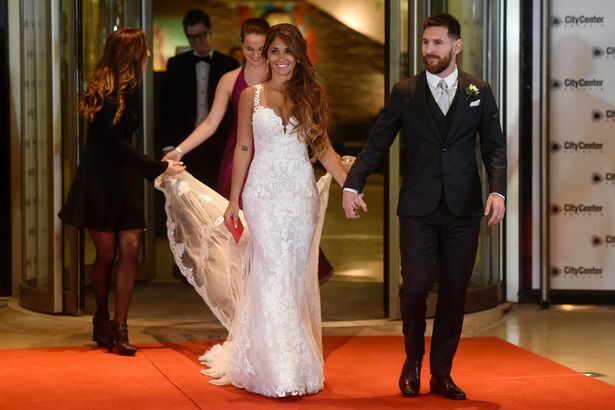 After the private civil ceremony, the five-time Ballon d’Or winner and his wife posed on the red carpet for their fans and were surrounded by hundreds of journalists at a hotel and casino complex. 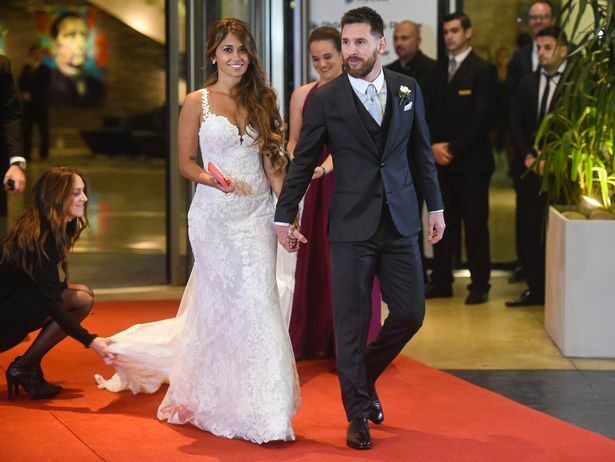 The couple looked beautiful, with Messi sporting a black tuxedo and his wife Roccuzzo grabbed eyeballs in her mermaid-style gown designed by Spanish designer Rosa Clara. Ex-Barcelona midfielder Xavi Hernandez waves to the crowd. 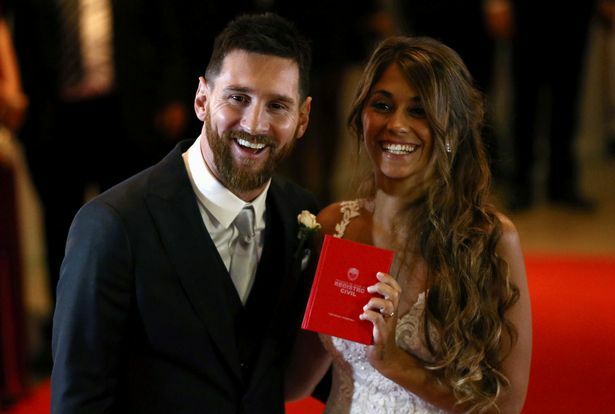 Lionel Messi and Antonella smile on the red carpet after completing their vows in front of family and friends. The star couple’s children Thiago, four, and Mateo, one, were spotted at the front seats at the ceremony attended by some 260 guests, including Barcelona legends Xavi Hernandez, Carles Puyol, Samuel Eto’o and Messi’s current team-mate Gerard Pique, who came in with his pop star girlfriend Shakira. Former teammate Samuel Eto’o was among the first to arrive. Former Barca player and pal Cesc Fabregas also attended the event along with his wife. Manchester City star and Messi’s international team-mate Sergio Aguero was also in attendance. Chelsea’s Cesc Fabregas and his wife. 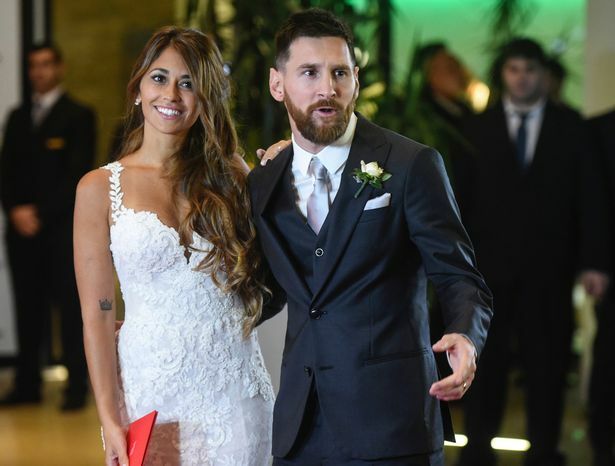 The two other members of the incredible Barca attacking triumvirate – Luis Suarez and Neyamr also attended the wedding ceremony. 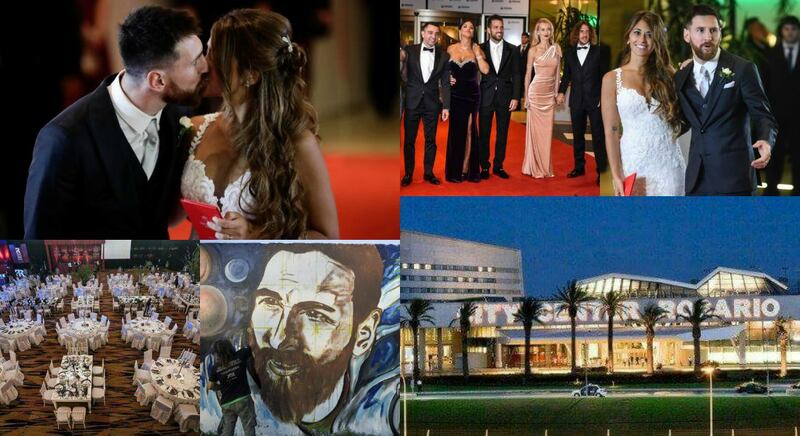 The Argentine press branded it the “wedding of the century” for Rosario. One of the cutest couple in the footballing fraternity fell in love when they were teenagers. The pair started dating in 2007. They spent their childhood days in Santa Fe, Argentina, before Messi left for joining the youth academy at Barcelona aged 13. The marriage ceremony also handed the couple some breathing space amid legal woes. The Spanish Supreme Court last month turned down his appeal against a tax fraud conviction. Former Barcelona stars Cesc Fabregas, Xavi and Carles Puyol, with their partners . Leaving all worries behind them the couple looked in high spirits and Roccuzzo was the centre of attraction in her curve-hugging dress with a deep sweetheart neckline and embroidered straps, designed Spanish designer Rosa Clara, who also dressed actress Eva Longoria and Spain’s Queen Letizia. 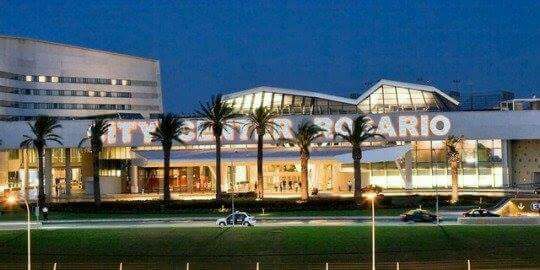 The wedding ceremony took place at 2200 GMT in the City Center casino, which is right next to the city’s poorest and most dangerous neighbourhood. Jordi Alba with his wife. The hotel shares a border with a poor neighbourhood which is known as the birthplace of the drug gang Los Monos. Rosario is a gritty port city which is linked with crime and violence. In last five years, the drug-gang has claimed more than 1,000 lives. 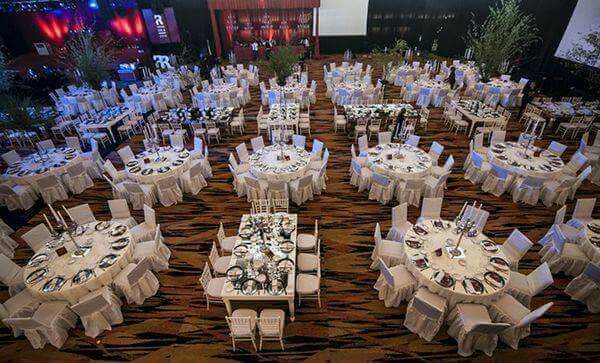 The private wedding ceremony took place inside the venue and the guests will be staying there too. The menu catered to almost all the cuisines and included roast gizzards, steak, salad, sushi, pasta and more. 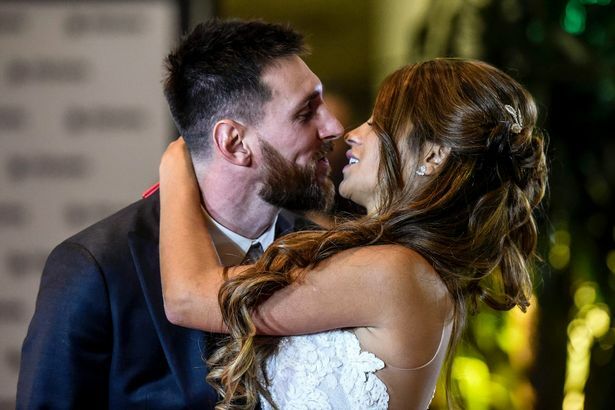 According to the sources, Messi has also asked his chefs to cook local cuisine like locro stew and empanada for the wedding guests. Argentina teammate Sergio Aguero and his wife wife Karina in attendance. 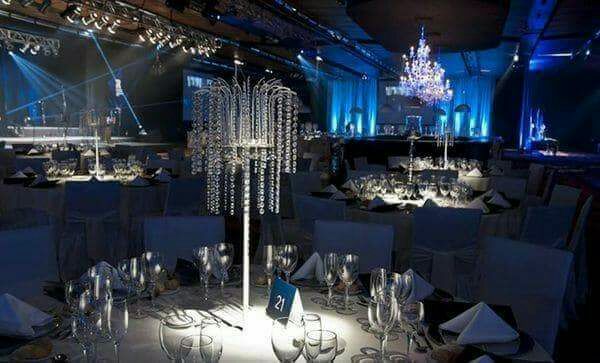 Messi’s Argentinean team-mate Sergio Aguero’s wife, Karina is all set to perform at the reception. She will perform the song for the first dance at the ceremony. The rest of the event’s music will be handled by Uruguayan pop bands Rombai and Marama. 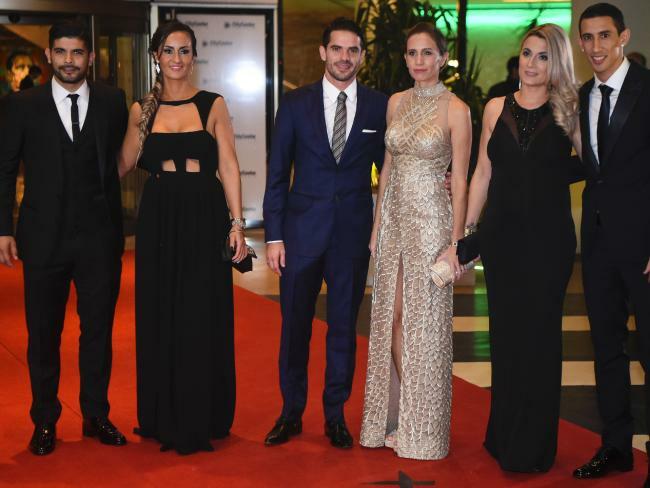 Paris Saint Germain’s footballer Angel di Maria (R), Boca Juniors’ footballer Fernando Gago (C) and Sevilla’s footballer Ever Banegas pose with their wives. 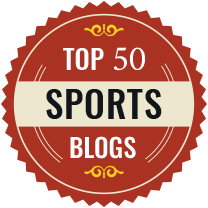 Taking the present decade into consideration, the two big names in the world of football that first hits our mind are Real Madrid star Cristiano Ronaldo and Barcelona legend Lionel Messi. Their path-breaking performances, breaking records, setting new milestones and battling neck to neck to top the charts is what the fans love to see and debate about. 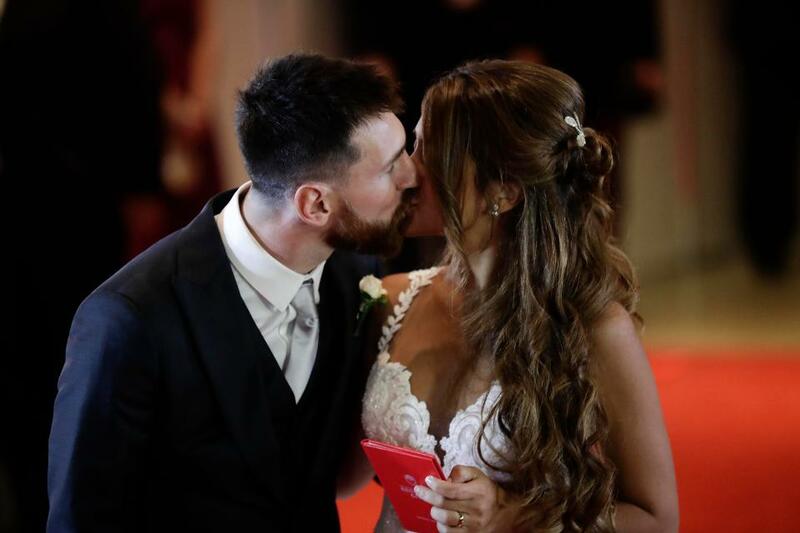 And after earning a legendary status in the world of football, Messi tied the nuptial knot with his long-term girlfriend and mother to his two children. 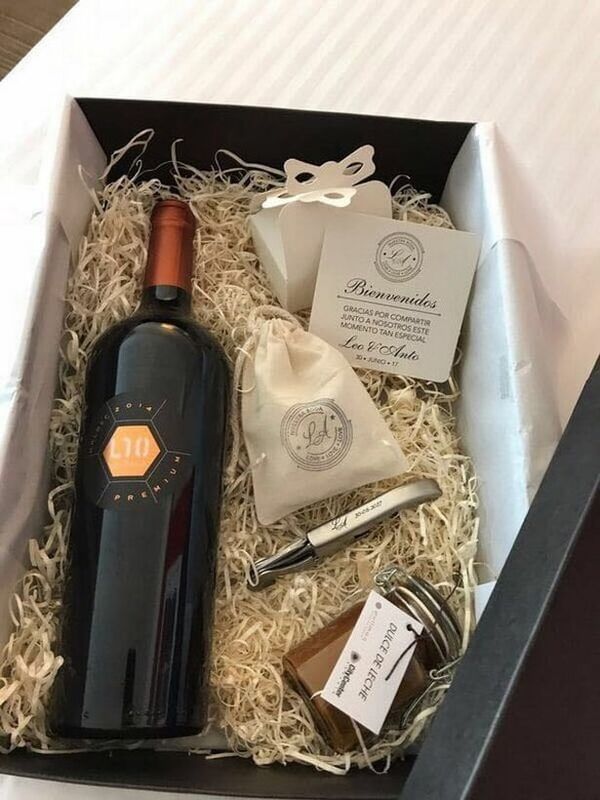 Gift bag for guests . 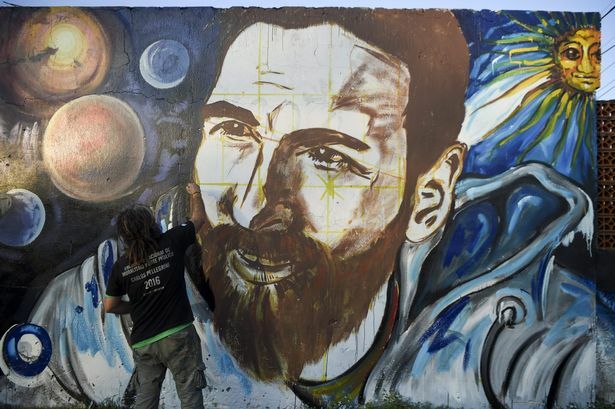 Messi has won the Ballon d’Or award five times and is seen as the world’s best footballer. 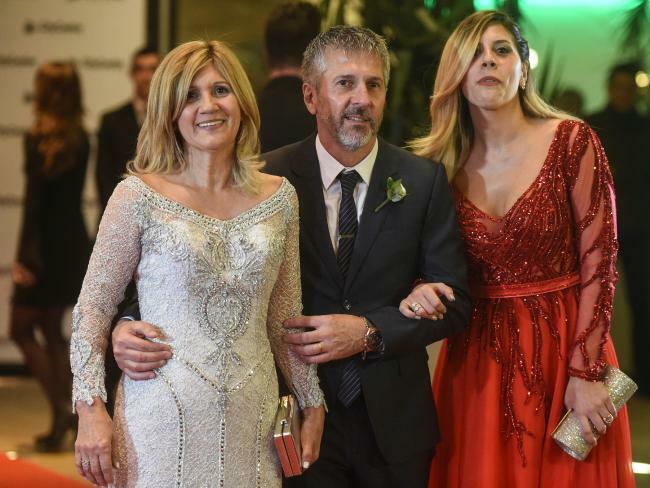 Argentine football star Lionel Messi’s parents Jorge Horacio Messi (C) and Celia Maria Cuccittini and his sister Maria Sol Messi. But friends of the star couple in their hometown accentuated that the bride and groom has always been very down to earth and has never forgotten their roots. Ezequiel Lavezzi has made the trip from China for the wedding. They had previously declared that they would not accept any wedding presents and instead they asked for donations to a children’s charity.